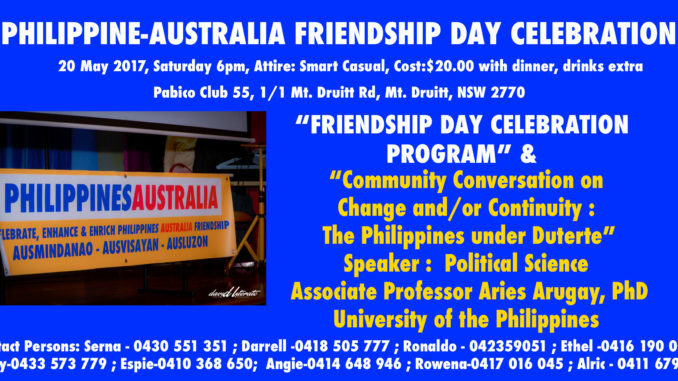 2017 Philippines Australia Friendship Day on May 20. 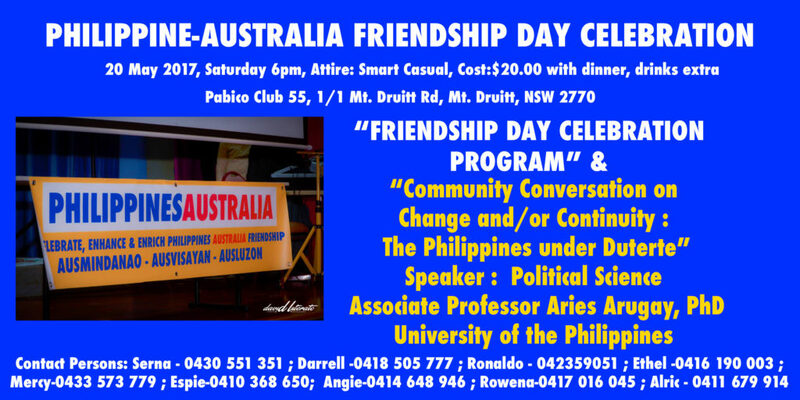 This is to invite the Filipino Australian communities in New South Wales and in the rest of Australia to the Philippines Australia Friendship Day 2017 (PAFD 2017) celebration and Community Conversation on 20 May 2017 at Pabico Club 55, 1/1 Mt Druitt Road, Mt Druitt, New South Wales. Guests from the Philippine Government and from a non-for-profit organisation in Australia will grace the PAFD 2017 celebration. In the community conversation segment, the visiting Political Science Associate Professor Aries Arugar, PhD of the University of the Philippines will talk on a topic “Change and/or Continuity: The Philippines Under Duterte”. PAFD 2017 is organised by Australia Mindanao Multicultural Communities (AusMindanao) Inc, Australian Visayan Multicultural Communities (AusVisayan) Inc and Australia Luzon Multicultural Communities (AusLuzon) and supported by the Philippines Community Council of New South Wales (PCCNSW) Inc.
Proclamation No. 1282 signed by the Philippine President in 2016 declares every 22 May every year as Philippine Australia Friendship Day. For more info, please contact Serna-0430 551 351; Darrell-0418 505 777; Ronaldo-0423 590 561; Ethel-0416 190 003; Mercy-0433 573 779; Espie-0410 368 650; Angie-0414 648 946; Rowena-0417 016 045 and Alric-0411 679 914.